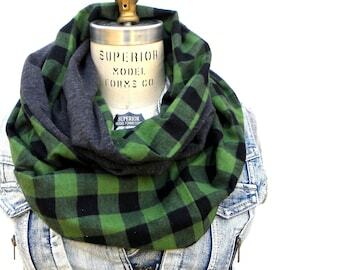 For the country-lovin' gal who loves everything buffalo plaid. I made this cross over bag with a vibrant red and black super soft brushed cotton. 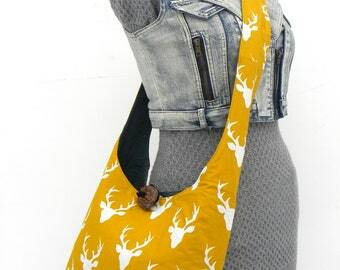 This bag is also fully and easily reversible. It flips inside out to feature a solid black fabric. Take this bag on a backcountry drive or on a walk in the woods. Sure to turn heads! For maximum comfort and versatility, there are 2 long straps that connect by tying them at your desired length. So you can wear this funky bag crossbody-style or you can tie the straps up short and wear it on one shoulder like a shoulder bag. This crossbody handbag can accommodate all beautiful heights and sizes. 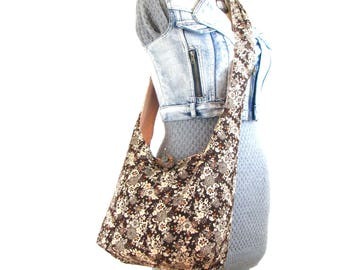 The closure for this crossbody hobo bag features one of my exclusive signature driftwood buttons. I collected the driftwood of the beaches of Quadra Island, on Canada's wild west coast. I have protected it with varnish, which also gives it some sweet shine. It the tell-tale sign of a bag from The Hobo Train. 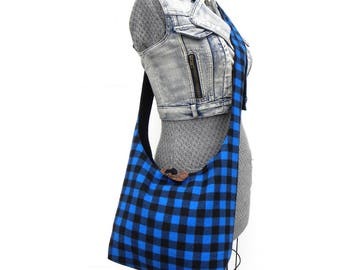 This buffalo plaid slouch bag is completely machine wash and dry, and vegan-friendly. ABOUT ME: I'm so proud to offer quality craftsmanship with a personal touch wrapped up in funkiness and some flare! I have been making and selling my handmade creations since 2006. Don't hesitate to convo me at any time. I'd love to hear from ya! This seller is amazing, I ordered this with my Christmas money, and unfortunately the first bag never showed. But Renee was so great and patient and we waited and it still never came. And she sent me a new one, I cant express how much I love this bag and how I wish every Etsy experience was like this. Girl, you need a raise. I cant wait to see where this bag takes me for my first adventure. This is very well made, very cute, and quite commodious. Thank you.